So, you want to find rare spawns and came to edit OpenStreetMap? Welcome to our community of people passionate about collaboratively building the best map ever! You and over three million of other contributors make OpenStreetMap possible. Welcome to our community – be excellent to each other and enjoy mapping our pale blue dot! 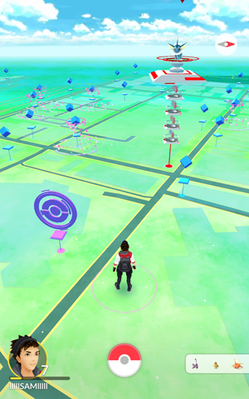 We’ve recently seen a flurry of new map editing activity from “Pokémon GO” players. Although this hugely popular mobile game displays maps from google maps (in fun colours), it seems it may be using OpenStreetMap data (according to some players) to influence “spawn points” within the game. There is some new interest in editing the map from Pokémon GO players, presumably because the game is found to be bringing in updates when changes are made to OpenStreetMap. It always takes new folks some time to get to know OpenStreetMap, and we hope Pokémon GO players will stick around to contribute some more. We’ve prepared the above guidelines to help understand some aspects of OpenStreetMap related to the game. You can contribute by improving the map, editing or translating the wiki, becoming a member of the volunteer Working Groups, increasing awareness about the project, uploading GPS traces, donating (donate.openstreetmap.org) or joining the OSM Foundation. You don’t have to be a member of the Foundation in order to edit OpenStreetMap. This entry was posted in Uncategorized on December 30, 2016 by OpenStreetMap. The box at the top should mention that footways should be connected to the rest of the network. But leaving this information away has also a positive effect: Pokémon mappers can be recognized easier. You might also want to read the recommendations for new (Pokémon GO) mappers by community members.